What does one do when they own something that is functional but it is, for a lack of better words, ugly? They grab a can of spray paint. That’s exactly what I did for this little project. I’ve had this file storage box for about 5 years. I bought it because it was in the clearance section, and I needed file storage. I didn’t buy it for its color. 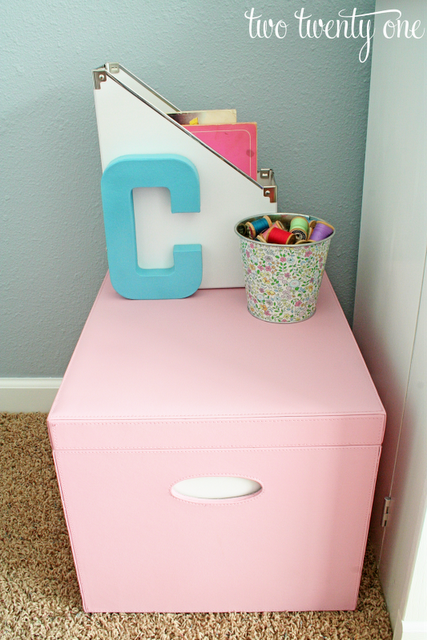 So last fall, yes, last fall, I spray painted it pink. Why are you just now reading about it? Because I do what I want. Just kidding. I don’t really know why it’s taken me so long to write a post about it. Maybe you’re reading about it now because I’ve been inspired by my recent trip to Ikea. Speaking of which, do you spy any Ikea items in the photo? Why yes, that is a Kassett magazine file and Forsommar plant pot. I should have bought at least one more pot. I love the design. Two packages of paper napkins with the design did come home with us. 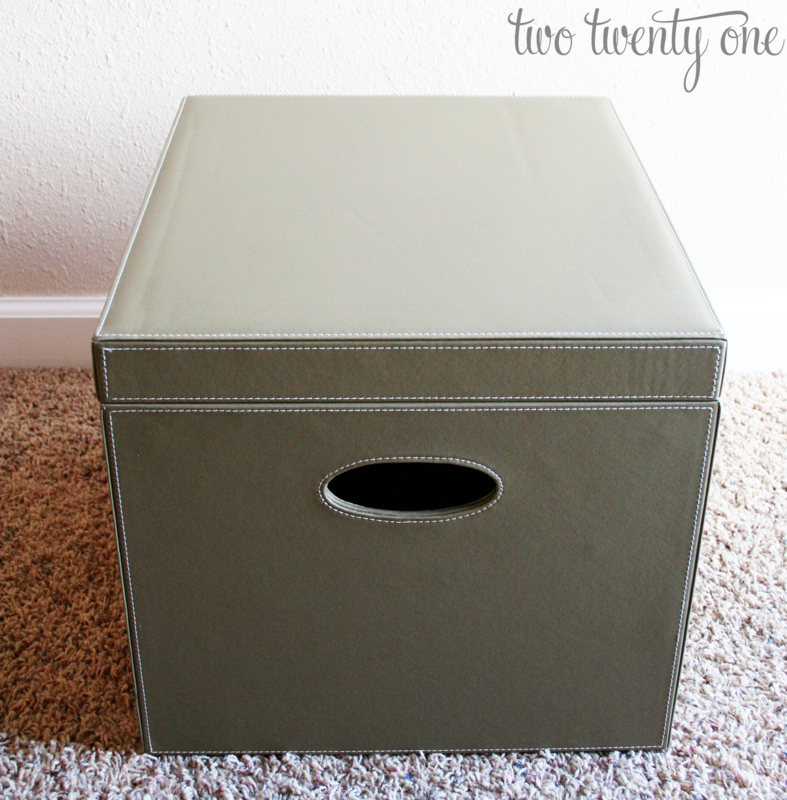 I plan on using the file storage box to store sewing supplies once I finish my filing cabinet. That’s why the box is sitting next to my newly updated sewing machine cabinet. The magazine file contains my sewing machine manual and a vintage sewing book that belonged to my grandma. I put some of my grandma’s vintage wooden thread spools in the pot. 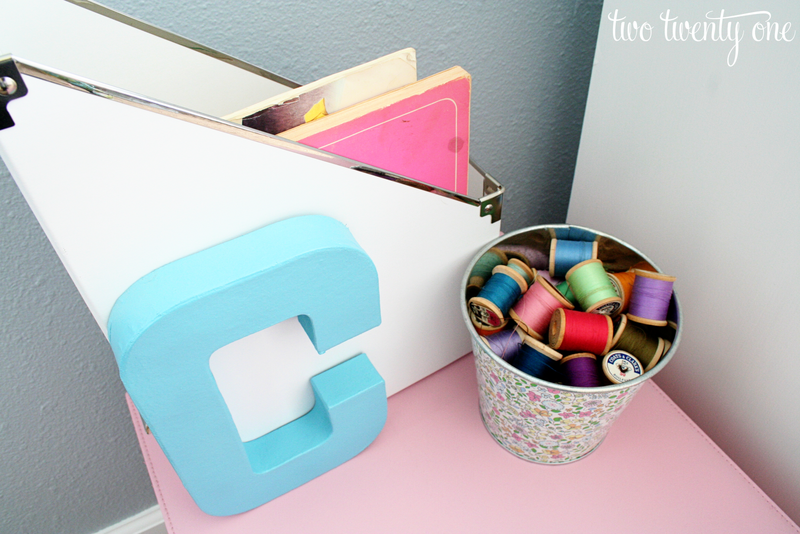 The “C” is a $2 paper mache letter from Hobby Lobby that I spray painted. I love the updated look of the storage box. It’s much prettier than the ugly green. No? Do you believe in the power of spray paint? 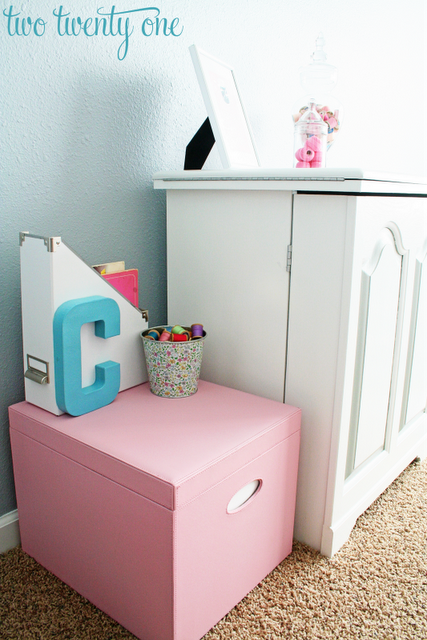 What’s your favorite spray paint makeover project? I do love me some spray paint. I just need to figure out how to remove it from our driveway. Oops. Wow, you really got great coverage on that box. Do you remember what type of spray paint you used? Thanks, Gayle! I’m pretty sure it was Valspar spray paint. The pink looks great! It’s amazing what a few coats of paint can do! Funny, I don’t think to spray paint things like that…but I SHOULD! Looks great. Gotta love spray paint. We have a scary ugly two-drawer metal file cabinet in our office. I didn’t think there was anything in the world that could make it look better, but maybe spray paint could do the trick. I doubt I could convince my husband to let me paint it pink, though. Way better! I did a little spray painting myself this morning, I love that stuff! My husband even organized a whole drawer for me int eh laundry room with all my cans lined up so I can get to them easily, love that! Very cute! I love the pale pink color you chose, too. You have an eye for color, friend. What type of material was it? It almost looks like pleather, which I wouldnt have throughout would cover so well. Great work! Cute! I love the new color. I had no idea you could spray paint something like that. Hmm now I should start looking for things I can spray. So tell me how did the spray paint work? Did you use a special kind? I actually have the same box, 2 in black. Never thought of painting them, but why not! I love it!! Adorable cabinet also! I have a type of storage piece like that, but in brown pleather – I am assuming that is what yours is – so, I’m going to spray paint it! Thank you for your inspiration and sharing! Oh, did you primer it first? Hi! I’m interested in learning more in DETAIL how you spray painted this box, I didn’t think that spray paint would work on something like that so I’m definitely inspired! If you have any tips, on how to spray paint it the RIGHT way?? Thanks! I am also intrigued by your use of spray paint, did you just go for it and spray it all over, or did you have to prime it,? Are you aware of any sorts of limitations of spray paint, ie, I wouldn’t have thought that you could spray paint pleather… what other types of meterial have you spray painted onto? Is it a special type of spray paint? How many coats did you have to do? I am inspired by all the possibilities! I’m doing inventory in my head right now of all the things in my home that I’d like to spray paint! I love what you have done here . 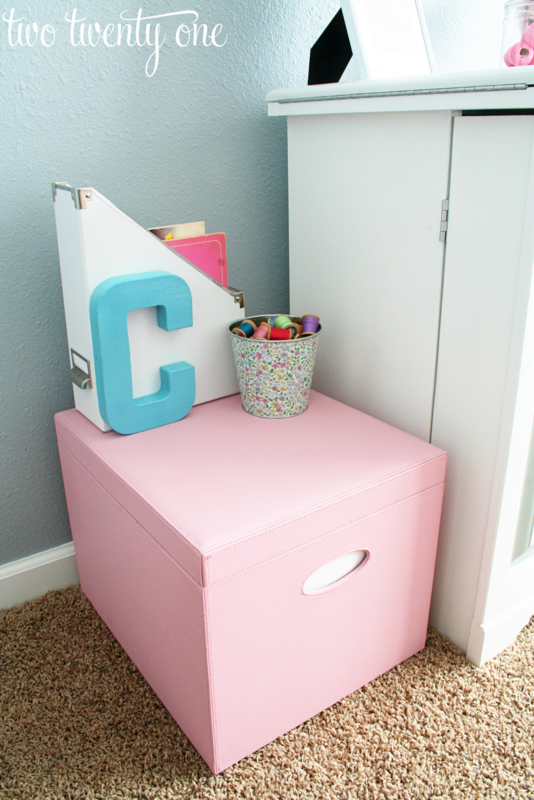 I was thinking about doing this with the ikea Kasset boxes as I can’t seem to find any light pink boxes that fit the expedit . May I ask what the colour of the spray paint you used was called ? Absolutely love your office by the way , saw it on Pinterest and was absolutely in awe ! Was the file box material? It looks like it from the pics.. was just wondering how the material took to the spray paint and how many coats did you do?